Tonight’s program features the answer to the question, What has eight arms and is totally awesome? – Squid, Inc. – the Bay Area’s hottest string quartet. 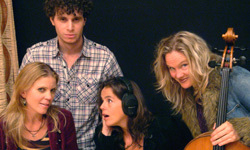 Violinists Hrabba Atladottir and Jory Fankuchen, violist Darcy Rindt, and cellist Beth Vandervennet give us their own versions of everything from Björk to bossa nova, with some classical too! Join us for this offbeat and upbeat concert. Join us for Classical at the Freight and enjoy stimulating music, beautifully played.